Using the Gemini Multi-Object Spectrograph (GMOS) on Gemini South, a team led by Jay Farihi (University College London) found, for the first time, a dust and debris disk surrounding a binary star with a white dwarf as a substellar companion. To date, almost all of the known planetary systems which include a white dwarf are single stars. Using GMOS spectra Farihi et al. identified critical metal features in the spectrum as well as the higher Balmer lines. From the Gemini data the team estimated a surface temperature of 21,800 Kelvin (about 3.5 times hotter than the Sun) and a mass of ~0.4 solar masses for the white dwarf star and a mass of ~0.063 solar masses for the companion. 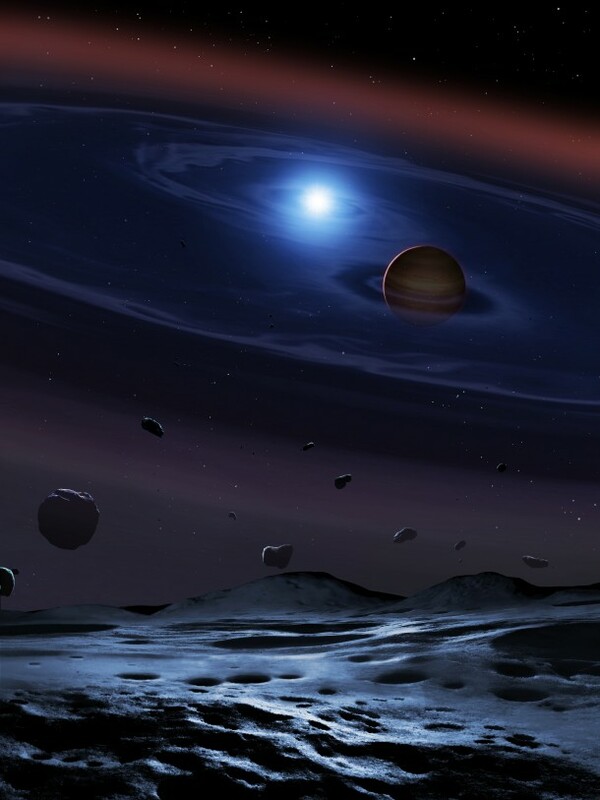 A disc of rocky debris from a disrupted planetesimal surrounds white dwarf plus brown dwarf binary star. The white dwarf is the burn-out core of a star that was probably similar to the Sun, the brown dwarf is only ~60 times heavier than Jupiter, and the two stars go around each other in only a bit over two hours. Credit: Mark Garlick, UCL, University of Warwick and University of Sheffield.